I just love your little pink flowers! You are so good at making those. I love this card. It's so simple, yet so interesting. what weight cardstock are you using? but PTI seems too "inflexible" because of the weight...? What an awesome, graphic card Laurie! Love the stripes on the orange panel and those awesome rolled flowers!! Totally awesome Laurie! 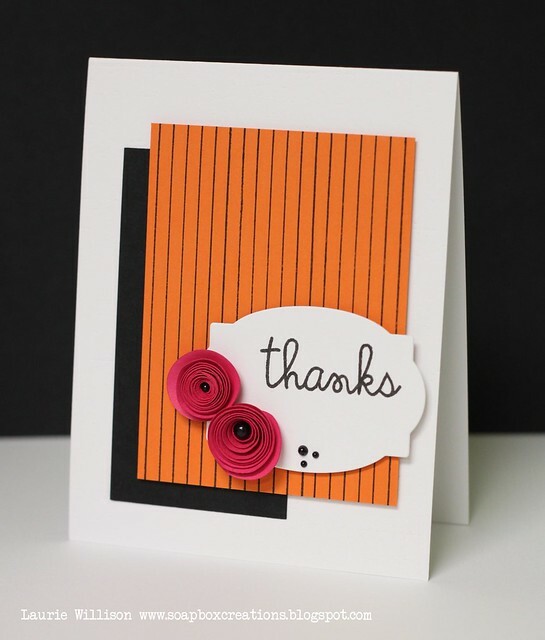 Love that sentiment panel, love the black lines on the orange CS! Great card girl! Your cards are always so stunning! So CAS and so perfect! I love this color scheme! And the sentiment is adorable. Hey Laurie! Thanks for stopping by my blog sweets. I've been stalking you and glad to have found your blog too. Your cards are beautiful. Love those flowers! So CAS...just your style! Love those rolled flowers! Beautiful card Laurie! LOVE yor CAS design, and those colours ARE just fabulous, I agree! ps your flowers rock!! Oh, there is that card I love!! So pretty!! Love the colors and the rolled flowers!! So vibrant and eye catching! You used the colors beautifully and those rolled flowers are beautiful.